Paul C. Cooskey, 73, of Harrisburg, died Oct. 24, 2011 at his home in Gettysburg. Born Oct. 25, 1937 in Baltimore, Md. he was the son of the late Henry and Virginia (O’Brien) Cooksey. He was the husband of Carole M. (Grimm) Fritz-Cooksey of Harrisburg. 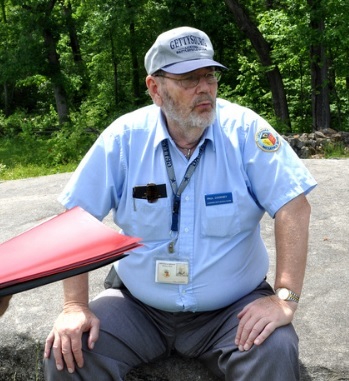 Mr. Cooksey was a Licensed Battlefield Guide in Gettysburg for over 25 years having been licensed in 1986. For many years he was employed as a Supervisor at the Department of Public Welfare for the State of Pennsylvania. In addition to his wife, he is survived by his daughter, Kelly Holcomb of Sparks, Nev; three grandchildren; one great-hrandchild; three step–children, Pamela Mackiewicz, Jeffrey Fritz, Melissa Clark; and two sisters, Martha Roper of Alabama and Mary Sanders of Florida. Services being handled by the Monahan Funeral Home, Gettysburg, will be private. The family suggests memorial contributions be made to your local SPCA or the Civil War Battlefield. Online condolences may be made at monahanfh.com.